Hey everyone! Time to vote for banquet awards!! Voting will close the night of Monday March 4th! We have had a busy couple weeks and so much has happened! We are into our final weeks! Here are some highlights and some information on sections and the team banquet. BANQUET — Team banquet is Thursday March 7th at Cherokee Tavern. Please add that to your calendar. More information to come! —— Girls competing at Sections- practice is required. Practice is optional for other JV kids that would like to still come workout. The meet is at Eastview High School and starts at 6pm. We will get sandwiches for the girls before the meet. Girls not competing will not get out school early, and they will need to get a ride to the meet on their own. The Section meet- girls not competing need to sit in the bleachers with other parents and fans. Only girls competing are allowed on the competition floor. The girls wrapped up the season’s dual meets against South St. Paul. The girls had a great night. The Varsity Team finished with a team score of 124.8. 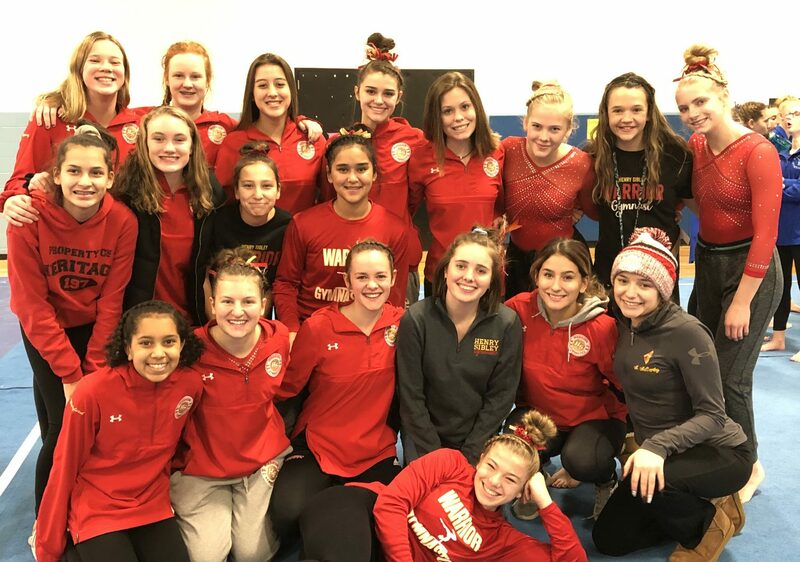 Varsity Highlights – Katy VanNatta took first on Vault and Bars and 2nd on Beam. Kira DuPaul took first on Beam and Floor, and 2nd on Bars. Haley Redding took 3rd on Vault and Beam. Kaiulani Taylor took 2nd on Floor. Anna Beniek took 3rd on Floor. It was a great night considering the girls didn’t practice at all that week due to snow!! The JV team did a spectacular job as well! They took first as well with a team score of 100.85! Maddie Sura took 1st on Vault, Bars and 3rd on Floor. Ava Warford took 2nd on Beam and 3rd on Bars. Kaiulani Taylor took 1st on Beam. Madyn Dupaul took 2nd on Bars. Annika Overvig took 3rd on Bars. It was a fun night for both teams! The girls had a fun and snowy night at JV conference. The girls finished 3rd with a team score of 101.85. They did a fabulous job and ended their season on a high note! The varsity girls had their conference meet rescheduled from February 7th to Saturday the 9th. The girls did a fabulous job! Thank you to all our parents and families that helped make the event a success!! We scrambled to get everything squared away and it was worth it. It was a great morning of gymnastics. The girls finished the meet in 2nd place and were runner up Conference Champs! They had a team score of 123.6. Katy VanNatta placed 3rd on Bars, and 5th on Vault. Kira Dupaul finished 6th in the All-Around. Thanks to all the girls who helped flash scores, and make the meet run smoothly!! Let’s get ready for Sections!! THE MEET TONIGHT FOR THE METRO EAST CONFERENCE CHAMPIONSHIPS- IS CANCELLED. We are currently working on rescheduling. We are working with judges associations, coaches and schedules. I will let everyone know the plan as soon as I know something. Hey Everyone! I thought I’d post the bus schedule and meet information so everyone has it in case they need it. It’s a big week and I can’t wait to see how these meets go! We’ve worked so hard and I know it’s gonna be a great week! The bus will pick up the kids at each of the schools before heading down to Hastings. The meet starts at 6pm. March in will be around 5:45. Thursday February 7th — VARSITY Conference at Henry Sibley High School. Girls competing will get out of school at 2pm. Others should meet in the gym when school is out! Please let me know if you have any questions about these days! Girls who forgot their order forms- Click the link on the right hand side.